design by Sara Baldwin with Barbieri Texture. Tuscan Handmade terracotta and Murano Glass inlay. 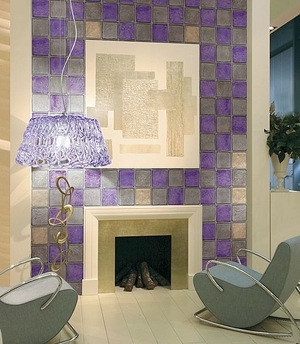 Glass tile, enclosing a metallic base, criss-crossed with extremely elegant lines. A tile that matches up perfectly with the AGADIR SILVR wash basin. The timeless elegance of platinum 999.99% and gold 24 kt meets with Murano glass lighting up it’s natural beauty with decorations and handworks performed by skilled craftsmen. Charleston Gunmetal is a smoky, ethereal grey mirrored tile, with a sleek bevel and a cool attitude. Proudly made in the USA. ... time requested on the case. COMBINATION OF MATERIALS Combination of stone and metals, stone and precious wood, stone and glass and many other applications permit us to produce real masterpieces of interior design. Glass tile is made from glass beads fused into a paste, to which a colorant is added. This produces vivid hues and visual effects due to its luminosity. It can be vitrified to improve toughness and reduce porosity. There is a wide range of colors; the finish may be polished, shiny, satiny, etc. Tiles range from 10 to 50 centimeters square, though rectangular and oval models also exist. These tiles may be used on floors and walls in nearly any setting, though their impermeability and resistance make them ideal for bathrooms, kitchens and even swimming pool interiors.